As FFA Convention Season is starting to kick off, I have a few pieces of advice to those who will be attending, whether you are members, advisors, parents, alumni, or somewhere in between. We all could have a little bit of advice as we celebrate the success while in the blue and gold. 1. FFA Members Why Are We Here? Whether it is your first time attending your state's convention or it your very last one, going to FFA State convention is exciting. You get to spend a few days with some of your best friends in school and meet so many new people while you are there. You hope your advisor takes the group on fun trips to drive go-carts and not to get in too much trouble. I have some advice for you: First, go outside of your comfort zone. Go meet new members from across your state, visit the career and college fair to see what is out there, state convention is the time to see who you can become. Make sure you plan with your hotel roommates on what snacks to bring so you have a great selection of midnight snacks. Take pictures, whether it is selfies while in the convention hall or a big group photo after a session. These memories will fade, but looking back at the pictures taken will send you back to a time where life was much simpler. Finally, HAVE FUN! The convention is only a few days long, so make sure the time that you spend there is something you do not ever regret. Take your students to the sessions, and whether you have someone from your chapter receiving an award or not, this is a learning experience for your students. They can see all of the accomplishments FFA members just like they have done, and the simple act of taking them to sessions can change their whole direction with the FFA. Be the support system of your chapter and organization because you are the foundation of it all. These students look up to you, and you have the power to take these students from great to extraordinary. For the parents who are going to attend a state convention, get ready! 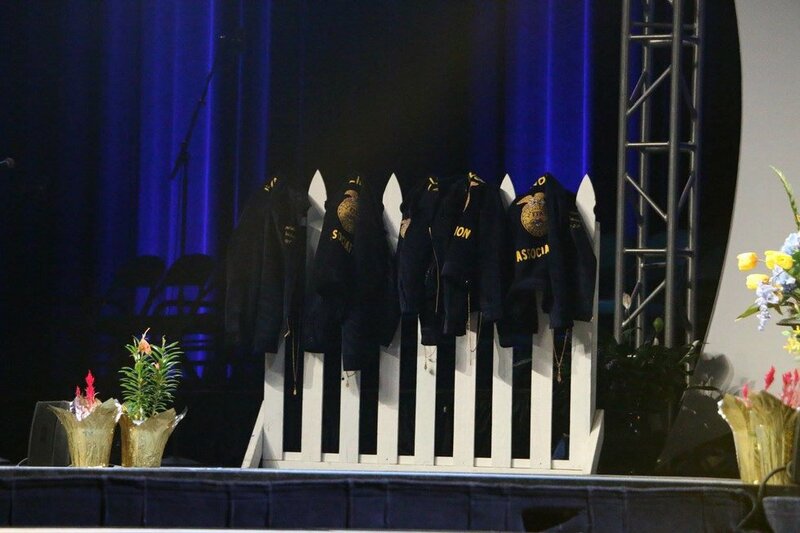 Whether you wore the FFA jacket yourself or never heard of this organization before, State Convention is a time for you to get excited about this organization. You will be surrounded by thousands of individuals who may come from different parts of the state you live in, but all come together to celebrate this organization. You may feel a little lost trying to maneuver the convention hall, but I will tell you that this an event that you do not want to miss. If you have the chance to attend your state's convention, take the first opportunity to go and become inspired by the organization your child is embarking on. It is not just changing the student's lives, but it is changing yours as well. Thank you for your support, without you the FFA organization would not be where we are today. I hope when you see FFA members running around the convention hall, you can't help but smile because you know the work you are doing is benefiting them. My advice is to keep doing what you're doing because without the Alumni and Supporters the FFA would be nothing. Your support helps all members work towards achieving their goals and dreams in life. Whether you wore an FFA jacket or not, you keep working hard to help change these students lives every decision you make. You are about to experience one of the biggest emotional rollercoasters of your lives. You never know if you are going to cry, throw up, or have a heart attack with all of the feelings you are experiencing. This is normal, but my advice is before convention happens is to find your "thing." Whether it is working out, listening to music, writing, or anything that can calm you down and bring you back to Earth. Keep your close ones close, they will be there for you through thick and thin with this experience. They will be there to hug you, wipe your tears away, and support you through the entire ride. So buckle in because you are climbing on an exciting and terrifying journey of your life. My advice to you is whether your name is called for office or not; life has fantastic things in store for you. You are going to change the world, but do not let this change who you are for the worse. Thank you for your year of service. Without you, this organization would not be quite the same. Whether you took a complete year off of college or balanced being a state officer while in school, you have made an impact in your state and this organization. This may feel like this be the end to all you know it, but it is nowhere close to the end. This is not the end of your story, it just the end of a chapter for you. There will be more pages of your life to follow, where you will grow and develop even more, and you will think back on your year of service with a smile on your face. My advice to you is to hug your teammates, family, and friends tightly at the end of the session. Throughout your career in the FFA, they have been there for you, and that won't change because you no longer wear a blue corduroy jacket. Retiring is not saying "goodbye," it is saying "see you later." Do not think you are forever done with the FFA because you are now part of a brand new side of it. Whether your State Convention was a few days ago or months from now, make your time worth it. You never know where those few days can take you. Corrine Harding is a sophomore at the University of Illinois majoring in Agricultural Leadership Education. She has grown up on a fifth-generation corn and soybean farm in rural Central Illinois where she was actively involved in FFA where she held numerous leadership positions from the chapter to the state level. From helping the family on the farm to competing in various CDE’s, her passion grew and continues for the agriculture industry and being a voice for the industry. Educating the public about the industry that has shaped her is Corrine's ultimate goal.